In a day where Buzzfeed and Fox News are popular, I shouldn’t have been surprised to learn that traditional journalism is hard to come by. I guess I held out hope that there were some news sources that actually cared to be truthful. I mean, even Buzzfeed posts corrections and they’re Buzzfeed! But, a recent interaction with The Atlantic has convinced me that most journalists nowadays are just sensationalist glorified bloggers (as a blogger, I can make unsubstantiated generalizations like that). A little background: I work for a company called SR Education Group. We run websites about online schools and yes, accept forms of advertising from for-profit colleges, as well as many reputable non-profit colleges. In early January of 2015, a reporter from the Chronicle of Higher Education reached out to me. She was doing a story on a survey that showed that websites like one of ours, guidetoonlineschools.com, didn’t clearly mark advertisements. After my initial freakout, I met with my CEO and we decided that she, and the survey, were completely right and we should tell her that. Over a month later, the Education reporter for The Atlantic published an article about the same Noodle survey. Well, it’s mostly about for-profit colleges but the last five paragraphs (or the entire conclusion, if you will) is dedicated completely to the Noodle survey. The reporter then mentions a different site of our company’s, OnlineU.org. OnlineU.org wasn’t included in the Noodle survey, guidetoonlineschools.com was. So, why was there a mention of OnlineU? What place did it have in this article? What’s troublesome is that she explains all the conclusions of the survey and then equates them to a completely different site. One of the conclusions from Noodle’s survey was that for-profit colleges can pay to be included in “rankings.” Any reader would then naturally equate this to OnlineU.org. I emailed the reporter to let her know she made a mistake: OnlineU.org does not accept any paid placements within our rankings. OnlineU was our company’s attempt to do something truly helpful and unique. We are extremely proud of that site and it is nothing like the lead generation sites cited in the survey. Not only is her response snarky but it also completely misses the point. The point is that Noodle did a survey on three sites that make money from lead generation. Any results drawn from that report apply to those three sites and those sites alone. Applying all the findings to any and all sites that earn revenue from leads is reaching. And it’s irresponsible of a reporter to not make any distinction. The reporter also freely admits that Noodle provided them a list of sites. So Noodle, itself provided OnlineU.org for her to mention. Why would they do that? My best guess is that we handled their findings about guidetoonlineschools.com in a swift and responsible manner so they could no longer talk about that site. We told the Chronicle reporter that they were correct and we’d made all the changes their report suggests. They could no longer point to that site, even though it’s 1/3 of their report, so Noodle went after another site. And here comes the kicker: Noodle is a website about the higher education industry. They make money with a website about higher education, just like the sites included in their survey, even if they don’t accept leads. The commenters of the Chronicle of Higher Education article were very, very quick to point out this conflict of interest. Why not include their own site in the survey? Without including their own site, it just appears as if they are attacking their competitors. It seems to me that the reporter from the Atlantic probably got a compelling email from a marketing executive of Noodle and didn’t bother to think about it very much. She didn’t do her own research. If she had, she would have seen a clear conflict of interest, a non-significant number of people surveyed (203 is very low), and that the sites provided to her were not even included in the original survey. She basically just wrote what she was told, doing very little investigation or research of her own. And she writes for The Atlantic! This was a very disheartening experience. I thought The Atlantic was a quality publication in a world with very few left. But the current news cycle is so much about speed and no longer about research and fact checking. I guess we all just need to be careful with what we read online, no matter where it’s posted. How did you answer her question? Does OnlineU.org have financial relationships with schools? SR Education Group does earn money through lead generation advertising. What I wanted to clarify is that OnlineU’s rankings are 100% comprehensive and unbiased: any online school, whether we have an advertising relationship or not, is evaluated on objective metrics and is ranked accordingly. There is zero consideration whether we advertise for the school on one of our other sites, and in fact, we have rankings on OnlineU with 0 schools that SR Education Group advertise with since they didn’t meet our criteria. 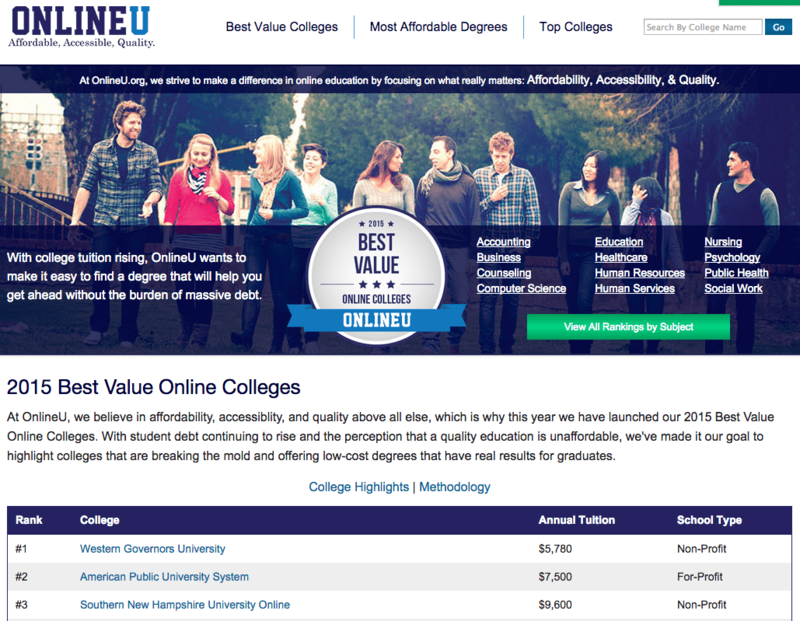 For instance, on our homepage we have our 2015 Best Value Online Colleges. For every single college, you can click on the name of the school to be taken to a blurb about why the college ranks so highly. From there, you can click Learn More. If the school happens to be a school we have an advertising relationship with, you get to a form page. If not, you get to an informational page that includes a link to the college’s website. It’s really important to us to communicate that no school can pay to be on any list on OnlineU; they must have the objective metrics to deserve to be on the list. Boomsies. You’ve hit so many nails on their heads with this, Kim. First, about journalism & the lack of reputable research & reporting conducted even in well-respected news agencies. Second, about the Dept. of Education’s responsibility to adjust accreditation to prevent “issues” like this from even being issues at all.